We had another biannual Jupyter team meeting this week, this time it was right nearby in Berkeley. Since I had read a poem at the last meeting, I was encouraged to keep that going and decided to make this a tradition. Here's the result, as delivered this past Friday, recorded by Fernando Pérez (thanks, Fernando!). say "Keep your spirits up" -- hope floats. Two weeks ago, I went down to San Luis Obispo, California for a five day Jupyter team meeting with about twenty five others. This was the first such meeting since my return after being away for two years, and I enjoyed meeting some of the "newer" faces, as well as catching up with old friends. It was both a productive and an emotionally challenging week, as the project proceeds along at breakneck pace on some fronts yet continues to face growing pains which come from having to scale in the human dimension. On Wednesday, November 9th, 2016, we spent a good chunk of the day at a nearby beach: chatting, decompressing, and luckily I brought my journal with me and was able to capture the poem you will find below. I intended to read it at a local open mic the same evening, but by the time I got there with a handful of fellow Jovyans for support, all of the slots were taken. On Friday, the last day of our meeting, I got the opportunity to read it to most of the larger group. Here's a recording of that reading, courtesy of Matthias Bussonnier (thanks, Matthias!). kelp bulbs popping in my soul. I have a lot to catch up on, but I'm really excited and looking forward to contributing on these fronts again! A crooked kink in public transport hose resolved. So what good is all of this if we don't engage one another - on a very real level? 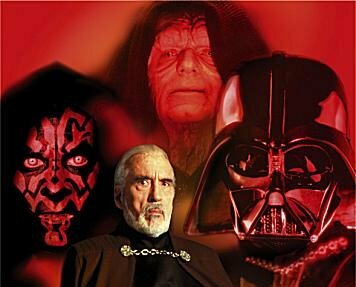 "Only a Sith Lord deals in absolutes," man - so let's get off the condescending trips and the polarizing anti-discourse. Let's use our full range - zero, one, two, five, seven, eight, ten, etc and not just on or off - there's an infinitude of wonder in between and out in every dimension. I resolve to hesitantly dip my toes in, from time to time, instead of being all in or all out. Talk to a beat stranger - but not every beat stranger. Give up some left over food to the guys on Bancroft and Telegraph (the Shattuck hobos are too hip for me - but I hope they aren't for someone else -- I know they aren't). I can just eavesdrop on the world from time to time - I can't always be wide-eyed gulping from the fire hydrant of information flowing at 100 terabits per second eyes glazed over passed out exhausted gasping for a sense of self disoriented head-spun hours or days later. Just a drinking fountain or a tap and a few cups or liters a day would be fine. No need to parch yourself and dry up like a raisin all the time. It's ok to wrinkle and shrivel - and you don't need to burst, either - just be uncomfortably sincere. I think I'm going to try that. goddamn google just doesn't know what to do with itself, anymore. Oh yeah, feel free to drag the little man around the blue highlighted streets, and then rotate / zoom in the overlaid photo. Here's the official demo (cheesy video).In San Fracisco, almost every street is completely covered. 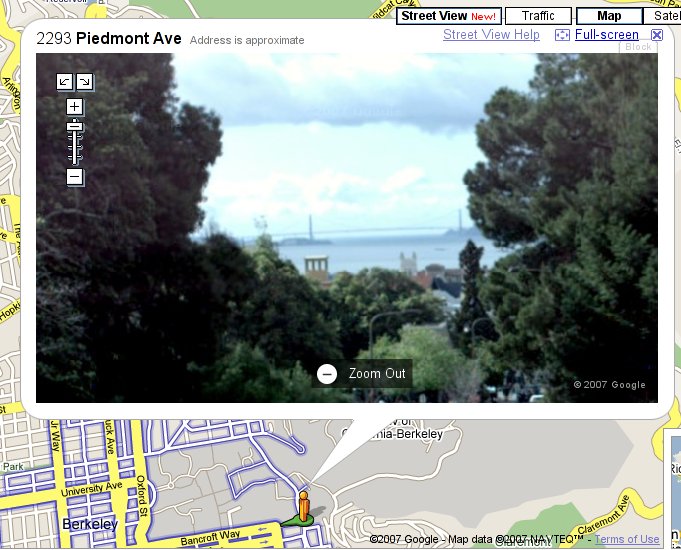 They also did much of Mountain View, Palo Alto, San Jose, and all of Manhattan, that I've checked.